Every fourth year between 776 B.C.E. and 395 C.E., the Olympic Games, held in honor of the god Zeus, the supreme god of Greek mythology, attracted people from across Greece. Crowds watched sports such as running, discus-throwing and the long-jump. The sporting events at Olympia were the oldest and most important of the four national Greek athletic festivals. The games were held on an official basis every four years from 776 B.C.E., but they probably originated much earlier. Greek myth credited the hero Herakles with devising the running races at Olympia to celebrate the completion of one of his twelve labors. Olympia was the most important sanctuary of the god Zeus, and the Games were held in his honor. Sacrifices and gifts were offered, and athletes took oaths to obey the rules before a statue of Zeus. The games were announced by heralds traveling to all the major Greek cities around the Mediterranean, and hostilities were banned during the period around the Games to safeguard those traveling to and from Olympia. The games at Olympia continued with minor interruptions into early Christian times and were the inspiration for the modern Olympic Games, first staged in Athens in 1896. Chariot racing was the most popular spectator sport in ancient times. Up to 40 chariots could compete in a race and crashes were common. ￼In ancient Greece only the wealthy could afford to maintain a chariot and horses. Chariots had been used to carry warriors into battle, and chariot races, along with other sports events, were originally held at the funeral games of heroes, as described in Homer’s Iliad. Wealthy citizens and Greek statesmen were anxious to win such a prestigious event. They sometimes drove their own chariot, but usually employed a charioteer. The races took place in an arena called the hippodrome. The most dangerous place was at the turning post, where chariot wheels could lock together and there were many crashes. Charioteer and horses (detail), Panathenaic amphora, c. 410-400 B.C.E., 67.5 x 38 cm, Attica © Trustees of the British Museum. This vase belongs to a distinctive type given as a prize to the winner of the chariot race in the ancient games held at Athens during the yearly festival known as the Panathenaia that honoured Athena, the city’s patron deity. The vase would have been one of 140, each containing 40 liters of olive oil, given to the winner. 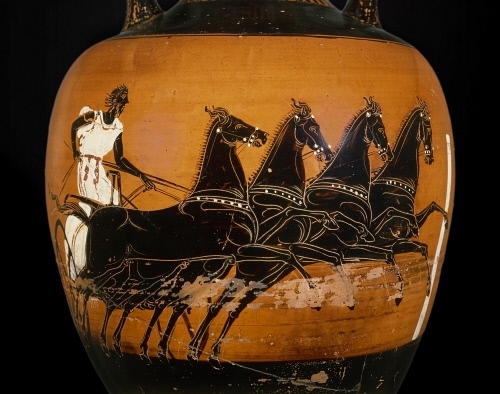 The painter of this vase has been highly successful in creating the illusion of speed as the chariot careers along. A quadriga chariot drawn by four horses is shown, the hair and tunic of the charioteer are blown back, and the manes and tails of the horses fly in the rush of air. The chariot is coming up to a post which may represent the turn or the finish of the race. Both moments would be climaxes. After the dangers and excitement of the chariot race came the horse- racing. This was hazardous because the track was already churned up, and the jockeys rode without stirrups or saddles, which were not yet invented. The winning horse and its owner were given an enthusiastic reception, and riderless horses that came first past the post were also honored. 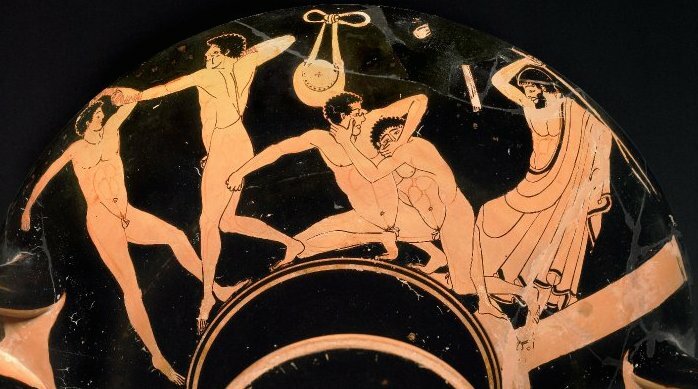 A big attraction at all the Greek games were the “heavy” events—wrestling, boxing, and the pankration, a type of all-in wrestling. Specialists in the sports could win large sums of money all over the Greek world, once they had proved themselves at Olympia. Exterior side A (detail), Panathenaic prize amphora of a chariot race, 490-80 B.C.E., red-figured cup, attributed to the Foundry Painter, Attica, Greece © The Trustees of the British Museum. 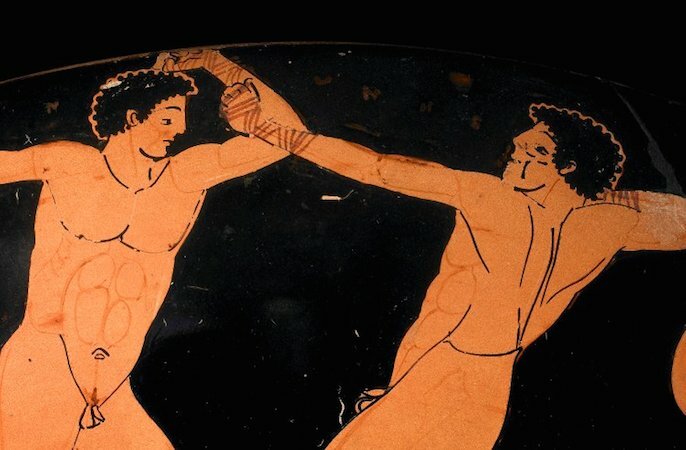 The pankration was a mixture of boxing and wrestling, where almost any tactic was permitted. Only biting and going for an opponent’s eyes were illegal. On the cup above, on the left is a pair of boxers in a bout. In the center is a pair of pancratiasts down on the ground. Above them hangs a discus in a bag. In the center, one pankratiast tries to gouge his opponent’s eye. A bearded trainer steps forward, his forked stick raised over his head to stop the fouls and the fight. Boxing was considered the most violent sport. There were no separate rounds in a match and the contestants fought until one of them gave in. In ancient Greece thin strips of leather were bound around the boxers’ fists to protect their hands. Boxing gloves were eventually developed, and in the Roman period they were weighted with lead or iron to inflict greater damage. A pair of boxers in a bout, exterior side A (detail), Panathenaic prize amphora of a chariot race, 490-80 B.C.E., red-figured cup, attributed to the Foundry Painter, Attica, Greece © Trustees of the British Museum. ￼The boxer on the left has his left arm bent up in front, his right arm back, and there is a dilute line on his cheek. His opponent, facing to the left, is seen in three-quarter back view, his left arm out in front, his right drawn back for a blow. His cheek is heavily marked with relief lines, under the eye and along the cheekbone, to denote swelling. Wrestling was a sport of great skill which used many of the throws still seen today. 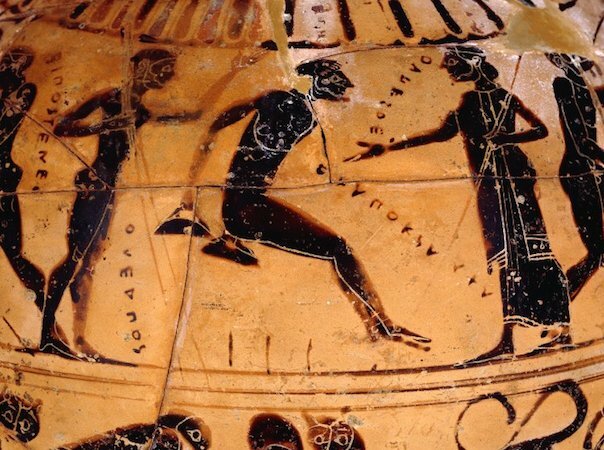 It also featured as part of the pentathlon (“pente” means five in Greek while “athlos” means contest, so the ancient pentathlon included five events: discus, javelin, long jump, running and wrestling). The most ancient and prestigious event at Olympia was the running race along the length of the stadium, a distance of 600 Olympic feet (192.28 meters). The Olympiad (the four-year period up to the next Games) was named after the winner, and dates were recorded by reference to the list of victors. Besides this equivalent of our “two-hundred meter” event, there was a race along two lengths of the track, and a long-distance race of twenty or twenty-four lengths. There was no “marathon,” this was the invention of Baron de Coubertin who revived the Olympic Games in 1896. In all these races the runners made a standing start, from a row of stone slabs set in the track that had grooves cut in them to provide a grip for the toes. Here, a runner is painted in silhouette, with the few inner markings reserved in the natural colour of the clay. His pose, with arms and legs fully extended and chest thrust out, suggests that he is running at full speed. Most sixth-century vase painters would have surrounded this isolated figure with ornamental friezes or panels, but this artist wisely resisted the temptation. This vase has one of the best surviving depictions of the long-jump event at the ancient Olympic Games. There was only the long jump, not the high jump, in Greek athletics. You can see that the athlete in the picture is holding heavy lead or stone jumping weights called halteres. These were swung to increase the length of the jump. You can also see three pegs in the ground which mark the previous jumps. 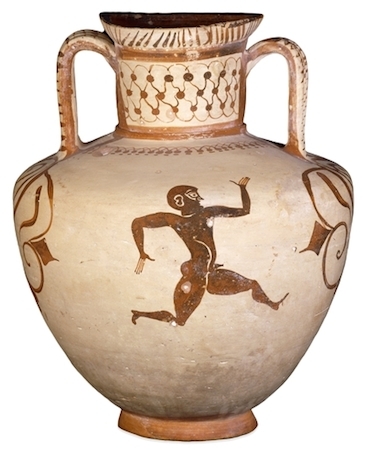 The athlete is shown on the shoulder of the vase, and is captured in mid-jump, while to the right a trainer urges him on. Beneath the jumper are pegs, which may record his previous jumps or those of other athletes. In the ancient long jump athletes carried weights that were swung forward on take-off and back just before landing. It’s often said that the weights increased the length of the jump, but it is more likely that they were there for use as a deliberate handicap. Most ancient sport developed as a means of training for warfare, and this exercise would simulate a jump carrying kit. Skill in this sport would be useful for crossing a stream or ravine. Athlete jumping (detail), Black-figured “Tyrrhenian” amphora showing athletes and a combat scene, 540 B.C.E.,Greek, but made for the Etruscan market, 42.15 cm, found near Rome © Trustees of the British Museum. 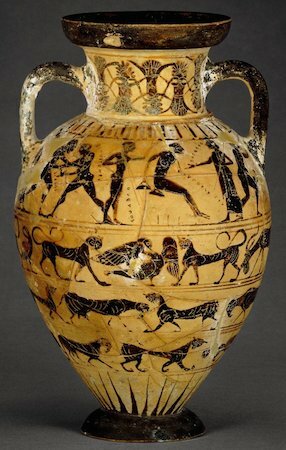 The vase has other scenes related to ancient sporting events, including a discus thrower. To the jumper’s left there is an athlete holding what are possibly javelins and two wrestlers are also shown. The pentathlon was made up of five events (discus, jumping, javelin, running and wrestling) which all took place in one afternoon. Running and wrestling also existed as separate events. There are differences between the ancient and the modern contests. Greek discus-throwers did not spin round on the spot: they rarely managed throws of more than 30 meters, less than half the modern Olympic record. In the ancient long-jump, contestants used jumping-weights. These where swung forward on take-off then backward just before landing, to add thrust and gain extra length. Some kind of multiple jump may have been involved. Javelin-throwing was similar to today’s event, except that a thong was attached to the javelin shaft to add spin and secure a steadier flight. 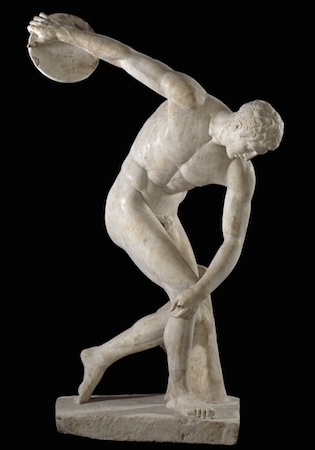 The head on this figure of a discus thrower has been wrongly restored, and should be turned to look towards the discus. The popularity of the sculpture in antiquity was no doubt due to its representation of the athletic ideal. 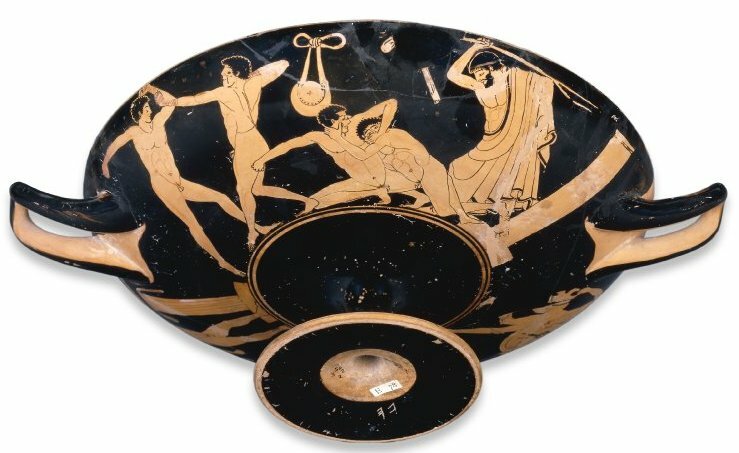 Discus-throwing was the first element in the pentathlon, and while pentathletes were in some ways considered inferior to those athletes who excelled at a particular sport, their physical appearance was much admired. Valuable prizes could be won in athletic contests all over the Greek world, but victory at Olympia brought the greatest prestige. Winning contestants were allowed to put up statues of themselves inside the sanctuary of Zeus to commemorate their victory; many bases for these statues survive. 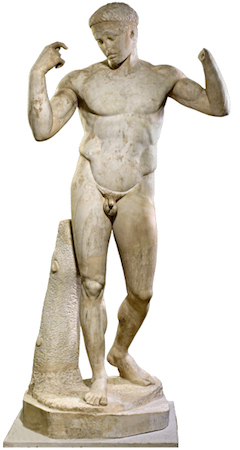 Statues of athletes and statesmen were a prominent feature of Greek cities and sanctuaries. If they won three times they could set up specially commissioned portrait statues which could cost up to ten times the average yearly wage. 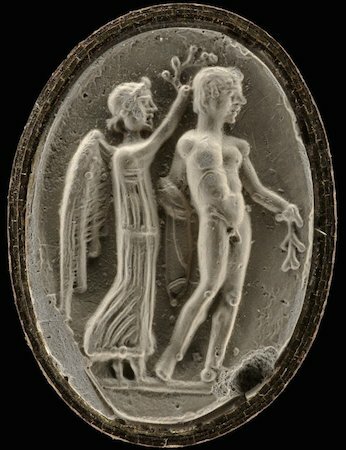 Sealstone with the goddess Nike crowning an athlete, 4th century B.C.E., 2.3 x 1.6 cm, Temple of Artemis, Ephesus © Trustees of the British Museum. Athletes tied a woolen band around their forehead, and sometimes around their arms and legs, as sign of victory. Winners at Olympia received crowns of wild olive, just as Herakles was said to have done when he had run the first races at Olympia with his brothers. This small engraved sealstone, perhaps originally from a finger ring, shows the winged goddess Nike placing a crown of leaves on the head of a winning athlete. In Greek mythology, the goddess Nike was a messenger of the gods and, more generally, the personification of victory. She was also closely associated with Zeus, god of the Olympic Games, and is often shown in flight, bearing a wreath or a victory ribbon, to crown victorious athletes. The athlete holds a small branch, also symbolic of victory. Whether this sealstone belonged to an athlete or simply a sports enthusiast we shall probably never know. Known as the Daidoumenos (ribbon wearer) this statue shows a triumphant athlete tying a ribbon round his head immediately after a victory. At ancient Greek sports festivals it was the custom to give ribbons to winning athletes. Later, at the awards’ ceremony, the athlete received a wreath of leaves such as olive, laurel or wild celery leaves, depending on the festival. The identity of the athlete and the event he won are not known. He may represent athletic victories in general. Victor statues were intended to immortalize successful athletes. Sculptors favored bronze for athletic statues, perhaps because it better represented tanned, oiled skin, but many were carved from marble. They were set on bases inscribed with a dedication to a god, the athlete’s name, father’s name, home town and contest. Over the centuries the river Alpheios, to the south of the sanctuary, folded and swept away the hippodrome, and the river Kladeios to the west destroyed part of the gymnasium. Following earthquakes and storms, a layer of silt was deposited over the entire site. Olympia lay unnoticed until modern times when an Englishman, Richard Chandler, rediscovered it in 1766. The German government sponsored full-scale excavations from 1875. The excellent local museum displays many of the remarkable finds, and the German Archaeological Institute in liaison with the Greek Archaeological Service continues to investigate the site to the present day. J. Boardman, Early Greek vase painting (London, Thames and Hudson, 1998). 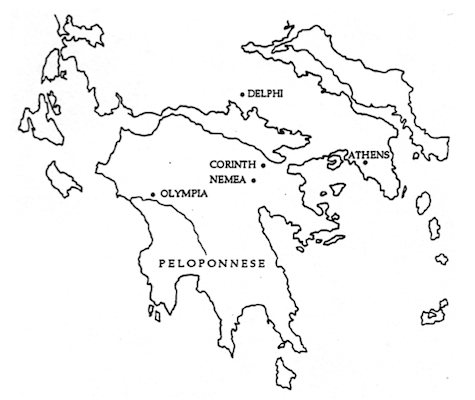 Richard Woff, The Ancient Greek Olympics (Oxford University Press, 2000). Cite this page as: The British Museum, "Olympic games," in Smarthistory, August 29, 2016, accessed April 21, 2019, https://smarthistory.org/olympic-games/.